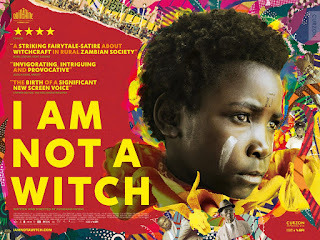 I AM NOT A WITCH (2017). Tickets: free to members / £4 for everyone else. A bewilderingly funny tragi-comic tale that veers into magical surrealism. 8-year-old Shula (played by newcomer, Margaret Mulubwa) is accused of witchcraft; faced with the options of accepting her supernatural branding and living life as a sorceress, or being transformed into a goat, Shula ends up at the local “witch camp”. Winner of the BAFTA Award for Outstanding Debut by a British Writer, Director or Producer this film draws on the director's mixed heritage and boldly scrunitises the modern-day persecution of Zambian and Ghanian witches with dark cruel humour and raw emotion. With stunning cinematography under the masterful hand of DOP David Gallego (Embrace of the Serpent) the film weaves its brutal and beautiful magic whilst we see our protagonist face trial for crimes of black magic, with her fate in the hands of others. Nyoni delivers a taut storyline whilst skilfully balancing moments of surrealist humour, of fleeting happiness and abject fear. Nyoni does an excellent job of keeping an absurd tone while losing none of the gravity of the situation. A gripping tale which we cant recommend highly enough. Don't miss it! Watch the trailer. The film is free to Worthing Film Club members (£25 a year - email Caroline at worthingfilmclub@gmail.com to join) or £4 for a ticket, cash on the door. For more details on membership, see here.